Russian cosmonaut Anton Shkaplerov, NASA astronaut Scott Tingle and Japan Aerospace Exploration Agency astronaut Norishige Kanai undocked from the ISS inside their Soyuz before landing several hours later at 8:39 a.m. EDT (12:39 GMT) June 3, 2018, on the Kazakh Steppe in Kazakhstan some 450 kilometers northeast of Baikonur Cosmodrome where the trio launched in December 2017. 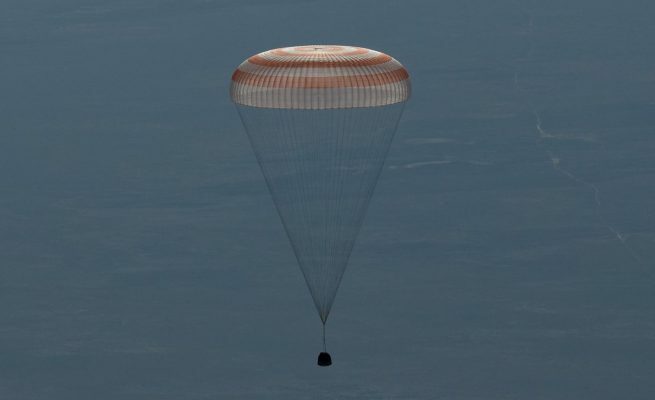 The trio’s trip back to the ground started just before 2 a.m. EDT (06:00 GMT) when they said farewell to the remaining three people on the ISS—Russian cosmonaut Oleg Artemyev, and NASA’s Drew Feustel and Ricky Arnold. After the goodbyes, the hatches between the Soyuz and ISS were closed at 2:02 a.m. EDT (06:02 GMT). Shkaplerov was the commander for Expedition 55, however, the day before leaving, he handed over his duties to Feustel via a change-of-command ceremony. Feustel will remain commander for the duration of Expedition 56, which officially began the moment Soyuz MS-07 undocked from the outpost. Once the hatches were closed and leak checks performed, the crew got into their Sokol launch and entry suits and began preparing for their journey back to Earth. Undocking officially occurred at 5:16 a.m. EDT (09:16 GMT) from the station’s Earth-facing Rassvet module, where the vehicle had been since its arrival on Dec. 19, 2017. The undocking and departure occurred in several stages. First, once the hooks holding the spacecraft onto the ISS separated, springs gave Soyuz MS-07 an initial push of about 0.12 meters per second. This slow coast lasted for about three minutes before a brief eight-second thruster pulse from the vehicle sped up the departure to about 1.9 kph. A second departure burn occurred a few minutes later speeding the Soyuz to about 3.4 mph (5.5 kph). This thruster pulse was 15 seconds long. With the successful departure from the outpost, Soyuz MS-07 continued to coast around the Earth, gradually getting farther and farther away from the ISS. At 7:47 a.m. EDT (11:47 GMT), the spacecraft performed a deorbit burn lasting around 4.5 minutes, slowing the vehicle down enough for it to intersect with the thicker part of Earth’s atmosphere. Just under 30 minutes later, and only a few minutes from entry interface, the three pieces of the Soyuz spacecraft—the service module, descent module and orbital module—separated. Only the descent module with the crew safely inside is designed to survive reentry. The Soyuz MS-07 descent module reached entry interface at an altitude of about 122,000 meters. As the friction of the atmosphere started to slow the capsule down, the heat shield protected its occupants from the extreme heating. Quickly, the vehicle slowed down from about five miles (eight kilometers) per second to just 2.2 kilometers per second. This occurred in a span of about seven minutes and caused the trio inside to feel around 4.5 times the force of gravity. Once the velocity of the capsule was slow enough, a series of parachutes began to deploy culminating in a 1,000-square-meter main parachute that slowed the capsule to some 6.5 meters per second. Still needing to slow down even further, a final pulse by soft-landing engines fired about one meter from the ground to cushion the vehicle. While the crew was securely strapped in, many Soyuz riders have describe last phase as similar to being in a car accident. While the capsule is often pulled onto its side by winds dragging its parachute, this did not happen during Soyuz MS-07’s landing. It landed upright. Conditions at the landing site were sunny with perfectly clear, blue skies. Shkaplerov was pulled out of the capsule first, followed by Tingle and then Kanai. Each were carried to nearby couches were they were given refreshments, including fruit. After a few minutes of enjoying their first fresh air in nearly six months, the trio was taken inside a nearby inflatable medical tent for initial health checks and to get out of their Sokol suits. Next, they were loaded onto separate helicopters and flown to Karaganda, Kazakhstan, where they are expected to board separate aircraft to travel to their respective space agency headquarters. This was Tingle and Kanai’s first spaceflight and Shkaplerov’s third. The Russian cosmonaut has now logged 532 days of cumulative spaceflight time. During the trio’s time in space, they were involved with the completion of hundreds of experiments ranging from materials science, biology research, and human health research, according to NASA. They were also present for the arrival of four cargo spacecraft, including the most-recently launched OA-9 Cygnus spacecraft. The other three freighters were the CRS-13 and CRS-14 Dragon capsules as well as Progress MS-08. CRS-13 and CRS-14 were each attached to the outpost for about a month beginning in December 2017 and April 2018 respectively. Progress MS-08 arrived in February 2018 and is expected to remain at the aft-port of the Zvezda module until at least August 2018. The three also ventured outside the ISS on separate spacewalks. Tingle’s outing occurred on Jan. 23, 2018, with Mark Vande Hei. That excursions task was to replace one of the two latching end effectors for the robotic Canadarm2. The extravehicular activity lasted for seven hours, 24 minutes. Kanai’s Feb. 16, 2018, EVA, also with Vande Hei, lasted for five hours, 57 minutes, and finished the work of upgrading Canadarm2—a process that spanned five spacewalks over four months. On Feb. 2, 2018, Shkaplerov and Alexander Miskurkin ventured outside on a Russian segment-based spacewalk out of the Pirs docking compartment. This record-setting EVA lasted four eight hours, 13 minutes—the longest Russian spacewalk and fifth-longest in human spaceflight history. The purpose of that outing was to replace a high-gain antenna on Zvezda. With Expedition 55 now in the history books, Expedition 56 is underway. Feustel, Arnold and Artemyev are expected to be joined in less than a week by three new crew members—Serena Aunon-Chancellor of NASA, Alexander Gerst of the European Space Agency, and Sergey Prokopyev of Roscosmos. The new crew is slated to launch at 7:12 a.m. EDT (11:12 GMT) June 6, 2018, in Soyuz MS-09 atop a Soyuz-FG rocket from Baikonur Cosmodrome. Once in orbit, the spacecraft is scheduled to spend two days catching up with the ISS to rendezvous and dock at the Earth-facing port of Rassvet just after 9 a.m. (13:00 GMT) June 8, 2018.